Discussion in 'The Lounge' started by jonKranked, Jun 17, 2013.
seriously. almost 8 and nothing? slackers. downhill on saturday. speed is creeping back up to what it used to / should be. had fam over to celebrate my moms birthday. AIN'T MONDAYS GREAT! My weekend was pretty much entirely preoccupied with work. Eff. Better than unemployment, I always say. I went out for my first bike/run duathlon training session yesterday. 20 mile road ride with the MBC at 16.8 mph, then immediately afterwards did a 5K run in 26:40. I expected a lot more fatigue on the run but my legs felt fine. I'll need to push harder on the bike next time. THIS IS WHY WE TRAIN, FOLKS...TO FIGURE SCHIT OUT. My shoulders hurt. I'm getting old. Howdy all. Cincinnati is kind of nice, at least in this neighborhood, Mt Adams. Tuesday afternoon I'll be stopping by the Zenith Aircraft factory in Missouri to test sit in a plane, because why not? Mornin! Did not step in dog poop getting out of bed, so today is already off to a good start. Just gotta survive the day with a run and hopeful sale of some photo gear happening tonight. Offloading my Nikon DX gear in case you are interested, see the pending for sale thread in creative pursuits for more info. long weekend. Kindergarten graduation stuff Friday. Kid got a new FF helmet from Grandma...fits into an adult small remedy helmet! Sat = good old mountain biking. Took a snowmobile trail straight up a mountain by my moms. Lots of mud holes, no fancy purpose built singletrack. Covered in bugs on my ride/walk up. Flew down back to the car, though! Im not sure that means what you think it means. Heal up dude, guess you're getting to be that age. Today my little guy turns 1 year old. Where the hell did the time go?!? I guess I forgot the [/sarcasm] tag then? Yeah thanks... my back has been kind of jacked for years on and off. I did break a few vertebrae about 10 years ago, which probably didn't help. 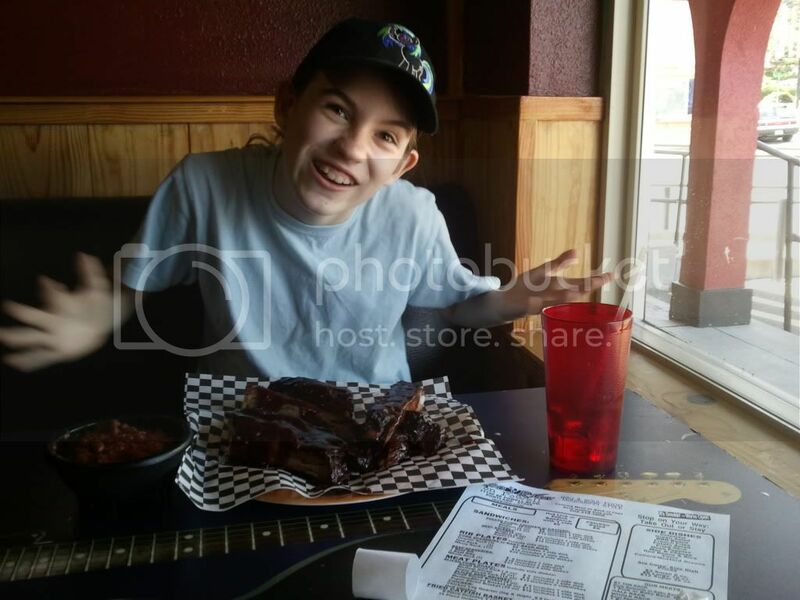 My daughter and I went to Reo's Ribs on Powell Saturday. She says "their glorious..." as they drop her half rack (with mild sauce) in front of her. Then played 9 holes, it was an awesome pre-pop day adventure. <edit> With red beans and rice sweet tea, of course. I got the slaw to go with the medium brisket, so good.